Mixology Caters has a team of hospitality professionals on standby. Our team includes bar managers, bartenders, chefs, and the always important line cook, banquet staff, and dish washers. Our staff are experienced and dependable professionals who bring the style of service that lets you relax and enjoy your decision to hire Mixology Caters. Simple or complicated, we’ve got this! We specialize in beverage catering. Our beverage catering service is equipped to provide the kind of bar service that ensures quality and efficiency. We offer one stop event planning. Planning special events can become a major production. Why not let us coordinate it for you? We have long-term relationships with food caterers, DJ’s, entertainers, staging people, and theater lighting companies. Mixology Caters has all the contacts needed to make your ideal event a reality. We are licensed and insured. We maintain a liquor caterer’s permit, as well as a full complement of insurance including liquor liability, personal liability and property damage. We are aware of laws in Northern California and Nevada regarding any additional permits needed, and will make sure you’re covered there. We provide uncompromising service. Our company provides world class service, supplies, and employees. Hosted Bar: Host pays for all beverage expenses; all drinks are free to guests. Non-hosted Bar: Guests pay for all drinks. Combination #1: Waters and sodas are hosted; liquor and wine are non-hosted. 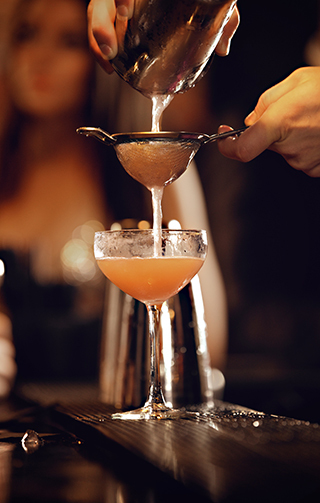 Combination #2: Two drinks per guest are hosted; additional drinks are non-hosted. Are you looking for a theme related party? Our trained staff can offer proven menus you can personalize to meet your needs. We can also help you with our large selection of specialty drinks designed and prepared by Mixology Caters.